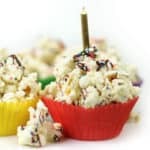 Every celebration deserves Chocolate Birthday Cake Popcorn! 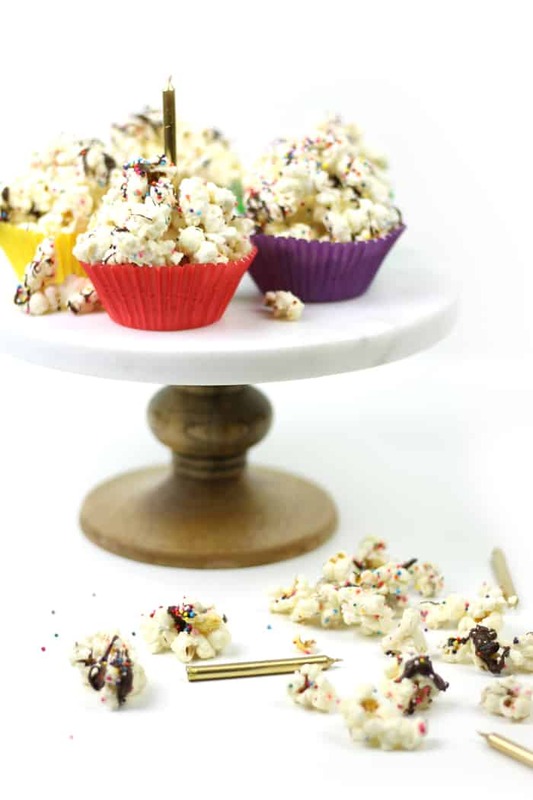 Sprinkle-coated popcorn with melted almond bark and chocolate make for a colorful and sweet party snack. Happy third birthday to Feast + West! 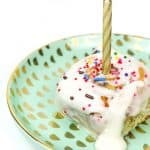 We’re celebrating all week with delicious birthday recipes. 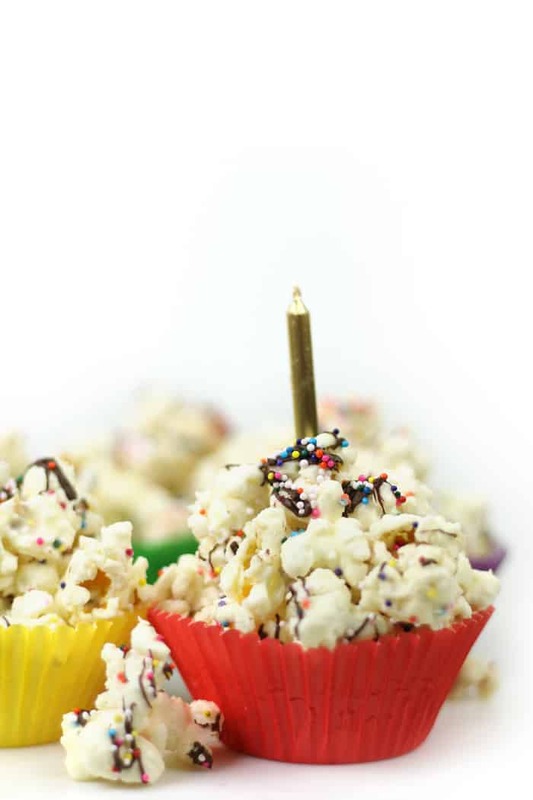 The first recipe of 2017 is Chocolate Birthday Cake Popcorn! 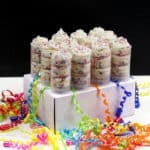 My favorite birthday cake as a kid was a colorful confetti box cake with store-bought chocolate icing and lots and lots of sprinkles. Makes me happy just to think about those luscious cakes! Kid birthday cakes were the best. And, sadly, those box cakes are not as delicious now that my taste buds have matured. Today I’m replicating it in popcorn form. 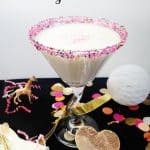 Aside from cocktails and cookies, I probably have the more popcorn recipes on the blog than any other kind of recipe. I’m a huge fan. 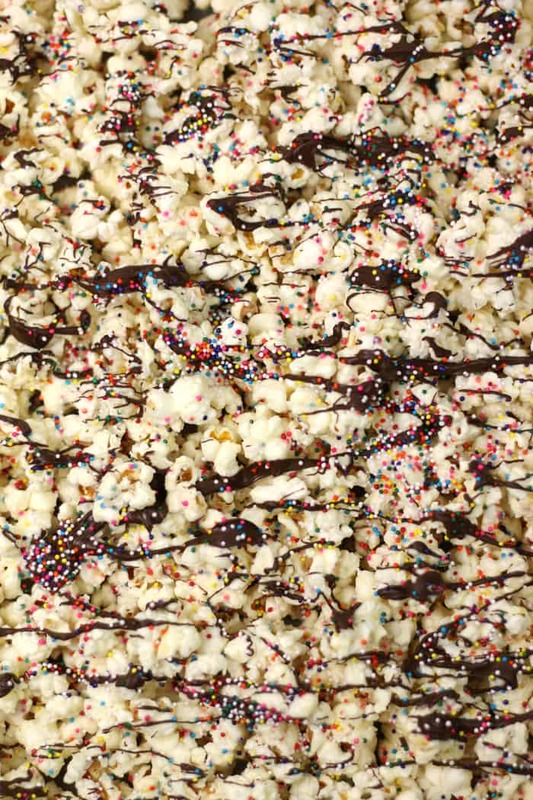 Chocolate Birthday Cake Popcorn is probably the most fun of all of them. It’s crazy crunchy and colorful, not to mention it tastes just like the birthday cakes of my youth. 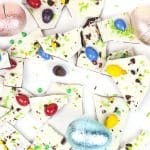 To make it, I melted vanilla almond bark and stirred in some yellow cake mix for extra cake flavor. Then I stirred in sprinkles and stirred it into a big bowl of popped popcorn, then added more sprinkles. I spread it out over a baking sheet and drizzled it with melted chocolate. So, it’s a new year, and surely you have a birthday coming up or you know someone who does. 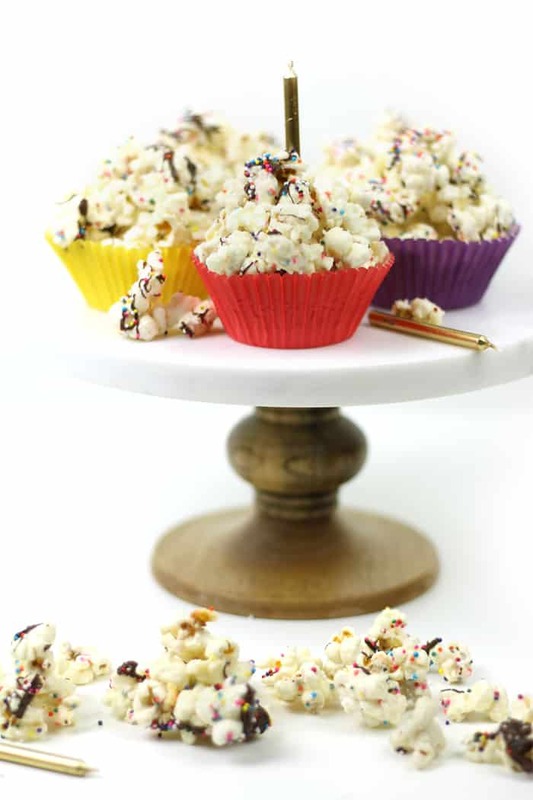 Might I suggest a big batch of Chocolate Birthday Cake Popcorn? In lieu of cake or in addition to cake. You can never have too much birthday cake, am I right? Love popcorn? 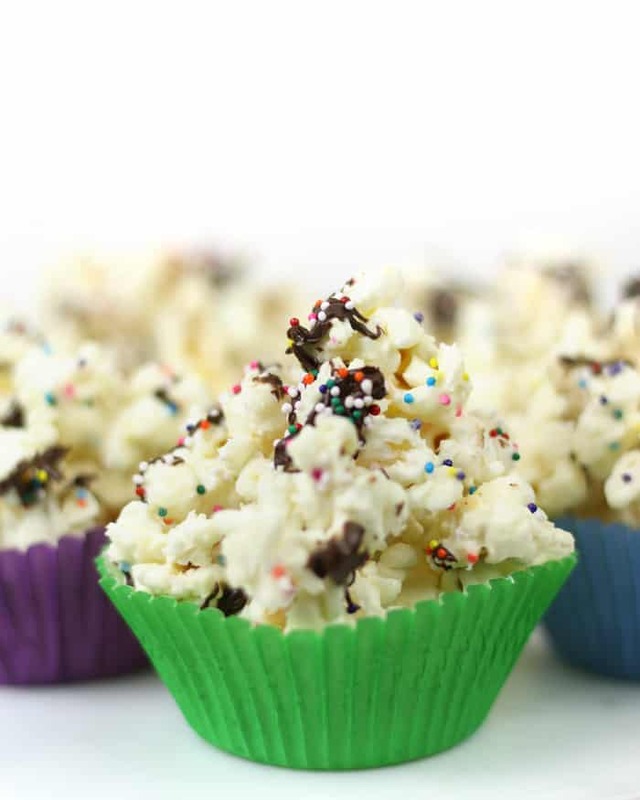 Here’s a ton more popcorn recipes for you! 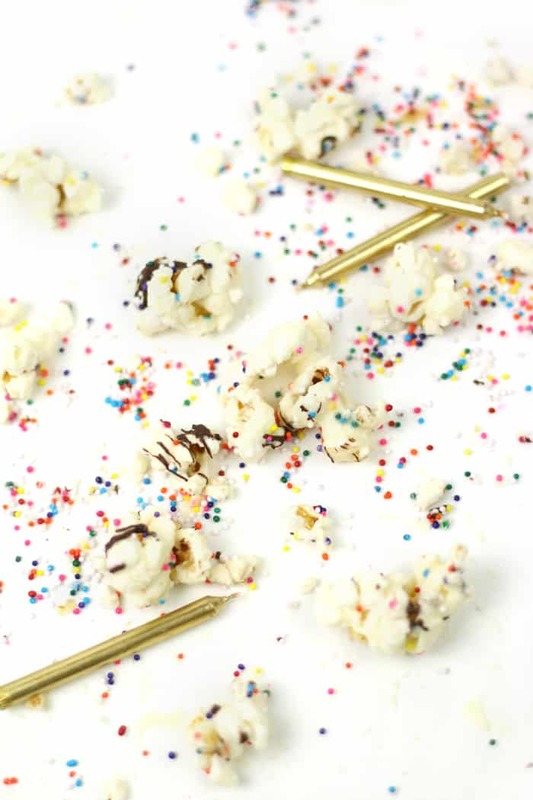 Pin the Chocolate Birthday Cake Popcorn for later! In a large bowl, melt the vanilla almond bark according to package instructions. Stir in cake mix until smooth. Stir in 1/3 of the sprinkles. Stir in the popcorn until coated evenly. Stir in another 1/3 of the sprinkles. Line a sheet pan with parchment paper. Top with popcorn and smooth into a single layer. In another bowl, melt chocolate chips according to the package instructions. Using a spoon, drizzle over popcorn. Top with remaining 1/3 of sprinkles. Place sheet pan in oven for 5 minutes, to allow sprinkles to stick to the chocolate layers. Cool completely before eating. Stir in an airtight container. Previous Post: « Hello, 2017! Isn’t it fun?! Your kids and I would get along, I think. Let me know how you like it, Barrie! Umm, this is AMAZING! 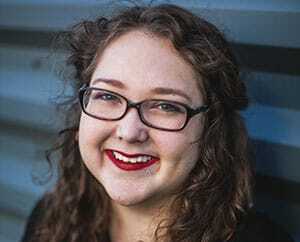 Happy birthday to F+W! Here’s to a fabulous 2017 with a LOT more fabulous recipes like this!